=================== The first story, "A Phantom Adventure" starts the ball rolling for Rob and Jimmy. See where destiny takes them. "Return of the Zytron Rebel"
Make payable to S.J. DiMaggio and mail to P.O. Box 313 Anahuac, Texas 77514. Be sure to include return address. If you like cookbooks, just take a look at this humdinger. Over two years in the making, and illustrated for clarity with over five hundred quality photographs; this masterpiece is perfect for the gourmet or the novice. 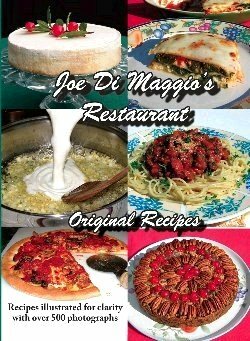 Each recipe is presented in a way to make cooking fun with instructions that are easy to understand. Beautiful pictures demonstrate procedures and show you how it should look. Interesting facts throughout the book add tidbits of knowledge about the dish you are preparing. Eating is an art form that is requisite to the Italian way of life. I think it is accurate to say cooking is an obligatory add-on ability. During my trek through life it has become apparent to me that many Italians do have intrinsic culinary skills; but in truth, eating is close to the top of the list. However, I'll not confine the love for good food to Italians. Who doesn't appreciate a perfect slice of Pizza or golden-crusted bread, Mother Nature's fruits and vegetables fresh off the vine with dewdrops glistening on flawless skin. How about a splendid wedge of well-aged cheese next to a glass of your favorite wine? Today the influence of Italian food in the kitchen circles the globe, but perhaps, nowhere as naturally as in our American homes. I dedicate this book to the millions of food aficionados across this country; I dedicate this book to America. A Seed in Time is about the oldest civilization in existence. The story begins in 1853 with the startling disappearance of a 49'er by the name of Frank Lupo. He vanished in full view of his wife, Josie, and four friends. Frank's mysterious disappearance soon spread causing much excitement and speculation around town. The three local newspapers reported the enigma with front-page headlines. The people closest to him, however, would never know the full extent of what happened to Frank Lupo that day. Indeed, the answers to the Lupo mystery came with the passage of time and the involvement of people not yet born. Stan touched the remote again, locking his office door, and settled quietly on his leather sofa. He stretched out pressing both hands to the back of his head. Gazing at the soft-lit ceiling, he though of Joanna. He could recall the extraordinary odyssey they had just shared two weeks ago in clear and vivid pictures; Yet, Joanna remembered nothing. Had it all really happened the way he remembered? Had his mind recorded all facts accurately? He would say things to her, offering little hints, and then look in her eyes for a glimmer of understanding. Nothing! How could she have forgotten? She had always been insightful and even more so lately, suggesting intuitive solutions whenever he shared problems he was grappling with. Tapping resources from deep within, her visceral feelings guided her; and she had given him direction and strengthened him when he needed it most. Hadn't he been told that's how it would be? Still, it annoyed Slone to think that some of life's occasional plumbs might be fruit grown from seeds sown somewhere in time. Stan had problems with certain aspects of the Sam Slone saga. Why didn't the Arthelings have their act together? They seem to have the same troubles and hardships Earthlings have, and then some. You'd think that they would have found solutions to their problems by now. After all, they are older than Methuselah, about a million years older according to Slone. How about this seed thing Slone called residual imprints? He claimed that when man is in an elevated mental state, when mind and instincts work together, he'd be able to reach within instinctively and draw from this planted knowledge. Did that mean, every time someone had a premonition, he was just picking the fruit planted in his ancestors' subconscious a hundred years ago? Should we attribute every precognition to our Artheling benefactors? How about extrasensory perception, and clairvoyance? Are all these things just the harvest of seeds planted in time, the animating force in our psyche that guides us to our destiny? The stories, created to both stimulate and entertain the minds of young readers, are spiced with intriguing historical references. With the belief that each generation need not assimilate each of life's lessons solely by trial and error, I have designed the stories as a means to lightly inspire, rather than lecture, the youth of today. A Phantom Adventure is a timeless story. A young boy's problems with the schoolyard bully become temporarily insignificant when he finds himself in the presence of his deceased grandfather and the great Leonardo da Vinci. Did his harrowing fall down the deep slope shake his senses? Is he hallucinating or experiencing reality? Eroz and Censen, beings from the planet Zytron, will guide the lad in his quest for answers to his dilemma and, in turn, have a profound effect on the teen's final confrontation with Muscle Mickey. 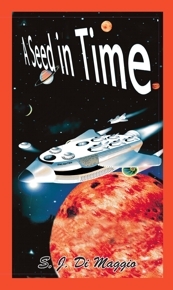 It's About Time takes Rob and Jimmy back in time with some exciting and unusual twist. Finally, you will know why the Mona Lisa is smiling. 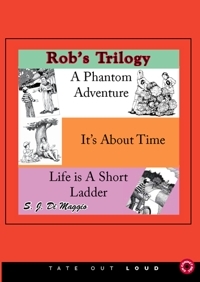 Life is a Short Ladder puts Rob in a position to deal with drugs in school and completes the trilogy which incorporates the same characters and calls for the protagonist to draw upon the wisdom of his departed grandfather and the special powers bestowed upon him by his alien friends. Rob's Trilogy, is filled with outlandish settings, a torrent of witty exchanges, and three nifty plots in the continuing saga of Rob and Jimmy's quest to delve into the secret powers bestowed upon them by their alien friends from the planet Zytron. Now available through OmniLand Books, the escapade tells of alien invasion and human abduction by these aliens for research purposes. The fictional account explains UFO sightings and "off-the-wall" occurrences, similar to those claimed to have been experience by people all over the world, in a humorous and thrilling manner. With the small town called Goodville as backdrop, the narrative begins with the landing of a flying saucer in the wee hours of the morning, when everyone and everything is asleep. Rob Campisi, one of the two protagonists in the story, finds the large, round, silver object hidden under the pile of tree branches after he falls down a steep slope and rolls to the dry creek bed below. The discovery and subsequent meetings with aliens usher Rob and his friend, Jimmy, into outrageous but remarkable experiences. The aliens catapult them back to 1804 to witness historical events that made a great impact through to the present day. The oldest continuously operating lighthouse at Sandy Hook adds an interesting twist to the plot in Return of the Zytron Rebel, the fourth adventure that will be in book stores soon. The exciting adventures of Rob and Jimmy clearly manifest the author's "loyalty" towards his fellow earthlings. Though the book shows the advanced technology and intelligence of the alien invaders, the author insists on showing that humans might be primitive in several respects; but Earth's inhabitants are never easy to subjugate and vanquish. This audio version of Rob's Trilogy was superbly crafted by Tate Out Loud. Relax and listen as the stories unfold, in your car, at home in your favorite chair, or anywhere you choose. The kids will love this new way to pass time on that trip to grandma's house or wherever. 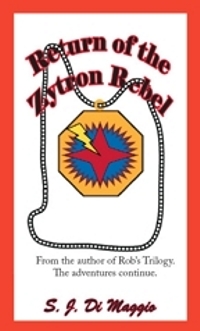 Return of the Zytron Rebel is the fourth adventure in the continuing saga of Rob and Jimmy's quests to delve into the secret powers bestowed upon them by their alien friends from the planet Zytron. 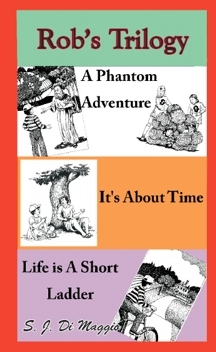 Although this story is a stand-alone adventure, and it is not necessary to read the first three stories, the characters make references to their past exploits and readers are excluded unless they have read the previous adventures. Rob Campisi, and his friend Jimmy played out the first three stories in Rob's Trilogy. Rob and Jimmy sprang into existence like the specters in Rob's Phantom Adventure, the first story in Rob's Trilogy. I need not tell you it is a work of fiction. However, the historical figures and events in the series are genuine. Return of the Zytron Rebel is no exception; I have taken some poetic license to make the story fit, but the facts are as true as history has recorded them and as real as I could portray them. I have relied heavily on the "Information Superhighway" for the many facts garnered in my research, and I've cited them in the bibliography at the back of the book for those who wish to know more about any event mentioned. Greg Jansky, is a character in Return of the Zytron Rebel who isn't historical or fictional. He is, in fact, a real tour guide at the Sandy Hook Lighthouse. The lighthouse plays an integral part in the story, and Greg provided many interesting details about Sandy Hook and was especially supportive in my effort to make all the details about the lighthouse accurate. 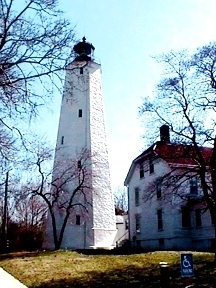 An amazing coincident: Because I wanted the facts about the Sandy Hook Lighthouse to be accurate; Sharon and I drove to Sandy Hook to do a little research. An amazing thing happened on that trip. I suppose one could credit it to chance, happenstance, or just a simple coincidence; but I must admit it had a touch of the Twilight Zone. Read on and see if you agree. second beam. It allowed him to stick his fingers in and hold on as he stretched to peer outside before returning to the platform. Of course, this is where Rob eventually hid the locket, and as it turned out, he had made a good choice. About two months later, my wife and I visited Greg and he graciously gave us a tour of the lighthouse. 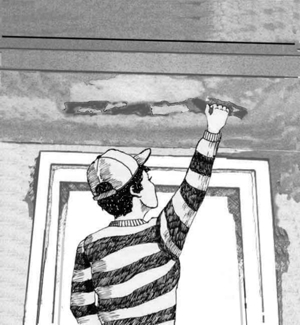 We decided to inspect the chosen window well to check the plausibility of what I had written. 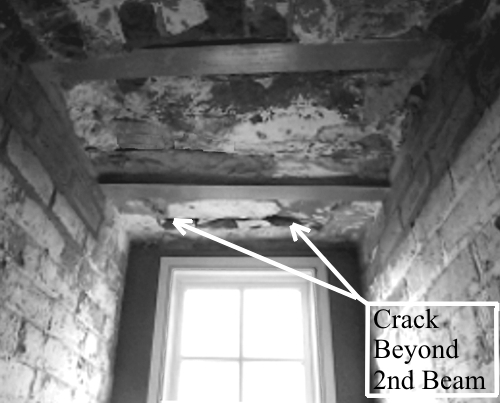 We climbed in the window well and there, just beyond the second beam, exactly as I described it, was a rather large crack. Greg said he had never seen it before. Later, he e-mailed me to say: "I actually double-checked the crack about a month ago while giving a tour. Every time I go by the window I think of the story. I've attached some pictures of the window well with the crack in the rubblestone for you." I've included one of Greg's pictures below and the resultant illustration used in the book. Another interesting fact: The window well pictured below is one of only two window wells with the original rubblestone ceiling still accessible. All the others were covered with brick. Sandy Hook Lighthouse is the oldest continuously operating lighthouse in the country, built in 1762/63 and first lit June 11, 1764; it was just 500 feet from the water's edge. Strong currents have washed the sand in from New Jersey and its shore towns, causing Sandy Hook to lengthen. The tower is now 1.5 miles inland from the tip. The lighthouse is a integral part of the story in this book. This is our entry into the world of romance. 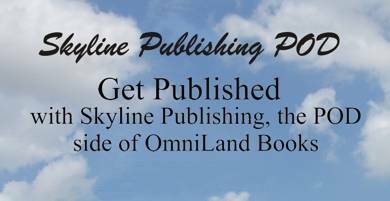 The first romance novel by OmniLand Books is in the works. Look for this exciting romance novel by Samantha Summer soon. 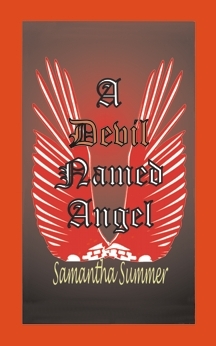 We look foward to publishing Samantha's book.